There must be something about bands from places like Olympia, Washington. Even though QUAYDE LAHUE are a young band starting out and presumably on the net and on the social media grid, they seem un-filtered. Being from up in the North-Western extremities of the US it seems like they’re more organic than say a band from a big city. Well, that’s ok for me as this EP is like it’s 1979 and it’s a young ANGEL WITCH at the helm. This is great and timeless straight-ahead Rock. 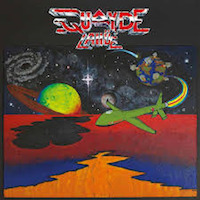 Ok, maybe QUAYDE LAHUE have a few old NWOBHM LP’s as an influence but they deliver their sound in a satisfyingly modern way. There’s more to it than that of course. First off, Jenna Fitton is a female singer; cool. So, let’s say ANGEL WITCH if they had a female singer mixed with early JUDAS PRIEST. What’s not to like with that formula. In fact, this adds originality and I even thought of JOAN JETT or obscure all girl 70’s rockers FANNY. “Day Of The Oppressor” is a five track EP with six bonus tracks that are as good as the first five and makes you wonder why it isn’t an album. But hey, who cares. First track “The Oppressor” kicks in with that retro feel but the vocals are clear in the mix. It reminds me of NWOBHM but with a clearer production. It still has that DIY feel and Jenna’s voice really adds to the overall delivery. There are quite a few young bands doing this sound such as Londoners AMULET but this is equal or better. “New Atomic Age” has a nice edgy riff and bass line. The song has a bit of early K K Downing style riffing. “Symbol Of Love” has a great solo section with drum rolls and cascading fret work. The production is clean and simple. Definitely retro sounding but this just sounds so good. “Nightmare” is a great cover of a song by Norwegian 80’s Rock band STORM including nice vocals and organ. That is the end the EP and if anything, the “bonus tracks” are as good, mostly heavier and more intense. “I Am Unworthy” is all feedback at the start with mainly rhythm and vocals on the verses with the guitars coming in between with proto Metal riffing. The solo wheels away beautifully again in a bit of an early PRIEST style. Jenna then does a bit of a vocal wail solo. “Conquest” has a distorted guitar beginning and breaks in to a classic galloping riff. WISHBONE ASH meets ANGEL WITCH; not a bad idea. This track has one of those nice vocal vs guitar finishes. “Same Old Song” is a softer Rock number with a gentle riff and THIN LIZZY style harmony guitars. The final track “Stray” has an early SCORPIONS feel to the riffs and solos and another fine vocal display. This EP is my kind of thing. Earthy, retro, great feel in the guitars and vocals and uncomplicated arrangements. Proper Rock with a nod to the classic early Metal sounds of the 70’s. Jenna Fitton gives the band the added dimension with her vocals and adds extra emotion to the tracks. I’ve checked out some of their videos and they look good live, too. I think we need more bands like QUAYDE LA HUE.